Hi. I've been trying to use up some of my ageing stash on each of my cards. Scrapbook Boutique. The paper was dark brown on the reverse which I thought was too dark, so I cut a pink pinwheel and folded it in with the dotty one to lighten it up. A double pinwheel! Here's the inspiration pic for the challenge. The waffles remind me of the pinwheel blades! I used heaps of snippets cutting out the letters so I'm popping into the playground again at Pixie's Crafty Workshop. 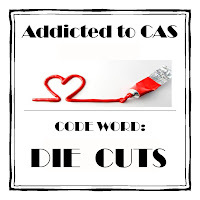 At Addicted to CAS the code word is die cuts. Materials used: Stampin Up pinwheel die; Memory Box Parker alphabet dies; Tiny Bubbles embossing folder; brad & sentiment sticker from stash. Oh Cathy, this truly IS a fun card! So fresh and the pinwheel is gorgeous! The have fun is so colorful and happy. This is a sweet card. Love the bubble paper. That is so effective. A super CAS card using your snippets. Race you to the swings at the Playground!! Too too cute Cathy! I really need to 'use up' my stash too.... but someone keeps adding to it and I just can't keep up lol. Love your fun cheery card! What a wonderful pinwheel! And the multicolor sentiment sets it off perfectly! 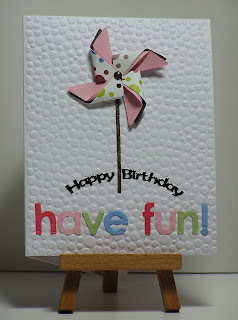 What an adorable card with those colorful letters and that pretty pinwheel! What a delightful design Cathy, love the pinwheel and embossed background with the fun letters. A super way to use your 'not-so-loved' paper ...made a fab pinwheel & the bright colors on the dotty paper was just right for the breezy shapes. Liked the brown back with the pop of pink too. Great EF with the brilliant colors of your sentiment & pinwheel. TFS & Hugs. I love your double pin wheel Cathy :) In fact the whole card with the colourful sentiment and embossed background is totally cute! What a lovely and fun card. Oh what a fun, fun card! I love that pin wheel and I love your color sentiment. I also love that this is a CAS card, they really draw my eye in to them. Great way to use up those snippets too. Great card! Love the background!! And your pinwheel is too cute! Thank you so much for joining in and sharing with us at Scrapbook Boutique!